1950 - The OSBI polygraph section is created and the first polygraph examination is administered. 1951 - Governor Murray asks that the Crime Bureau be placed under his direct control. 1952 - Gambler Barney Shelton offers a bribe to Bureau Director, George H. Wilson, in Wilson's office at headquarters. Shelton is arrested and taken to jail. 1952 - Agents investigate the assassination of Mayes County District Attorney Jack Burris. 1953 - A bill passes the State Senate that draws an " iron curtain" over Bureau reports, barring them from newspapers and the public. 1953 - The Bureau's Laboratory is created by the legislature. The lab has five divisions: chemistry, toxicology, ballistics, questioned documents, and polygraph. 1953 - Crime Bureau Agent and polygraph operator John Whittle is shot and killed by a 19-year-old suspect. Whittle was transporting the young man to headquarters for questioning when the suspect drew a pistol and shot Whittle as they drove into the parking lot. 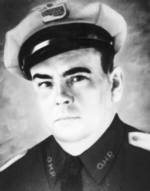 1954 - OSBI ballistics expert Roy Lambert testifies in the prosecution concerning the murder of Oklahoma City Police Detective Benny Cravatt. 1954 - Following the death of Nannie Doss's fifth husband, OSBI Senior Chemist and Toxicologist Taylor Rogers discovers enough poison in his remains to kill twenty men. The discovery sparks an investigation wherein Doss confessed to poisoning numerous other family members. In total, Doss was responsible for the deaths of four husbands, two children, her mother, two sisters, a nephew, and a grandson. The horrific case results in the creation of the State Medical Examiner's Office. 1955 - The beating of a Shawnee newspaper reporter by Pottawatomie County Sheriff Jim C. Harrington is investigated by the OSBI. 1955 - OSBI Director O.K. Bivins announces the addition of four new investigators, bringing the total to 15. 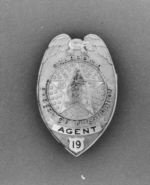 1957 - The State Crime Bureau is placed under the direct control of the Governor's office and is renamed the Oklahoma State Bureau of Investigation. 1957 - The International News Service installs a wirephoto machine, enabling the Bureau to flash photos of wanted persons to every major city in a matter of minutes. 1958 - The OSBI sponsors its first homicide seminar which brings statewide training to outside law enforcement entities. 1959 - The State Fire Marshal's Office becomes the Arson Division of the OSBI. 1959 - During the first few months of the year, the OSBI solves 82 of its 88 cases. Agents make 69 liquor raids.